I’ve always been an early bird when it comes to music festivals, not only are you receiving the best bang for your buck, but it is also a great opportunity to really see and appreciate the art around the grounds and taste some spectacular food, without all the crowds. Above all things though, I’m there for the music and arriving early to any festival is by far the best opportunity to catch some of the top up-and-comers and local acts up close and personal and in one place……ones that may just be headlining the festival in a few years to come. 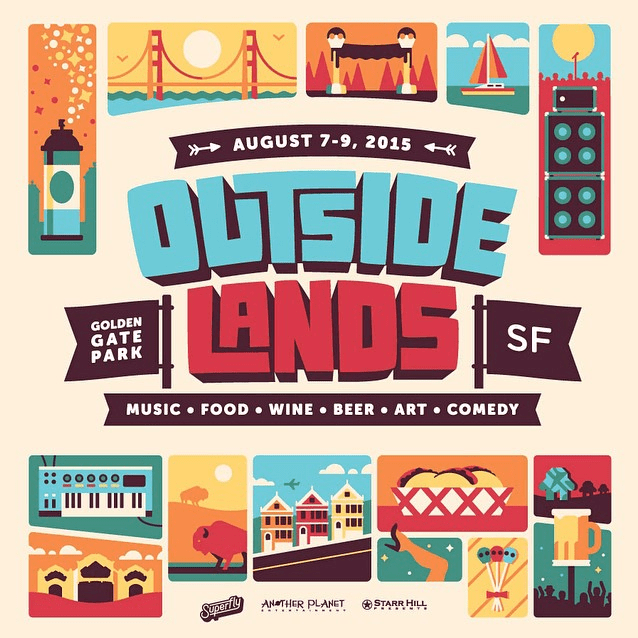 So here is my early bird’s music guide featuring twelve reasons to arrive before noon to each day’s lineup at Outside Lands 2015. If you are a frequent visitor to the Kitchen, you already know that we are big fans of Natalie Prass. She was a highlight of our week during this year’s SXSW and we’re delighted to see that she’ll be kicking things off at this year’s Outside Lands. What’s not to love about her delicate, romantic croon and super genuine song writing? Since the debut of her self-titled album, Natalie has been packing tiny gigs all across the US, winning crowds over with her beautiful sound. It’ll be exciting to experience the energy she brings to the Sutro Stage. If you happen to be on the other side of the festival during Prass’s set, you’ll get to experience San Francisco’s very own The Sam Chase who will be dominating the Panhandle Stage. Chosen as Best Band of the Bay two years in a row now by SF Weekly this rocking 7-piece will surely have a packed early morning crowd. These guys are per-form-ers and they know how to put on a show!!!! Your feet will be stomping and the crowd sing-a-longs will have your voice warmed up and ready for a full day of live music. On paper The Family Crest are a 7-piece indie rock band hailing out of the foggy streets of San Francisco, however in reality they boast an “extended family” of over 400 musicians who help contribute to their music, thus making them more of an indie rock ensemble. As Bay Area locals and the first show of the day on the massive Lands End Stage, they are sure to fill the platform with both musicians and instruments for an amazing orchestral-like performance. Expect plenty of horns, strings, percussion and good times. New Zealand synth-pop sweeties, Broods are a spectacular brother sister duo who will be taking the Twin Peaks stage to swoon all of your starry-eyed fantasies with their dreamy diamond soaked tunes. Their brand of music will have your head soaring in the clouds with no signature San Fran fog required. If you are one of the many who might be nursing a hangover from the Friday night party, you will most definitely want to head over to the Sutro first thing to get some proper first aid. Lay out your blanket and have a seat because Hurray for the Riff Raff will carry your headache away with their mellow, whiskey soaked folk music. The sound of the slide guitar, dance of the piano keys, and Alynda’s comforting voice will be just what the doctor ordered to get you back into the swing of things in plenty of time to finally decide between Mac DeMarco and Unknown Mortal Orchestra later in the afternoon. Twin Peaks are living proof that Rock n’ Roll lives on. If you are in the mood to get early morning rowdy minus breaking dishes over your head or launching eggs at your neighbor’s house, then you should head over to the Twin Peaks Stage for a face melting good time……and you shouldn’t need the schedule to remember that one……Twin Peaks at the Twin Peaks Stage. Are ready to dance? Did you warm yourself up with Heartwatch? Then this is your spot! Misterwives music is jam packed with more energy than a lake full of Red Bull and has a sound more infectious than the flu; partly due to Mandy Lee’s insane set of vocal chords. OSL coordinators were wise to put these guys on the Lands End Stage. Polo field is about to experience a dance party like no other and I anticipate a lot of people will be making their way to that end of the park to party on the grass (no pun intended). I met this rad Australian dude at Coachella earlier this year and among our lengthy talks on various musical topics, one thing I remember him saying is (and I’m writing this with my best Australian accent): “maaan, you neeeeeed to check out the DMA’s, they are blow’n up big, royt now” He must’ve told me at least 3 times cause it stuck and after the festival I eventually looked these guys up. Sho-nuff these Aussies are doing a great job of killing it with their working class, Brit-pop style of music, less the Brits. Their sounds has been compared to the likes of Arctic Monkeys and Oasis and their live performances have been receiving rave reviews. So if lads with loud guitars is your thing take my down-under buddy’s advice and make sure you hang a right towards The Sutro as you shuffle your way in Sunday morning. I’m going out on a limb with this one to say this performance will be for any and all Dead Heads out there. Real Estate bassist, Alex Bleeker has done a handful of Grateful Dead tribute shows this year in honor of the band’s 50th anniversary, and all have been met with great acclaim as many other great influential musicians in the form of Cass McCombs, Joe Russo (The Duo), Jenny Lewis, Dave Harrington (Darkside) and many others take the stage with Bleeker to pay tribute. Who will join him for OL on Sunday? I’m not one to speculate much, but one thing is for sure, if you start your day in the Pan Handle it is definitely going to be a killer jam session. Get ready to raise your spirits! If you give Alejandro-Rose Garcia (aka Shakey Graves) his guitar, custom kick drum and tambourine he could easily entertain crowds of hundreds alone as a one man band – and already has on more than one occasion. Although I doubt he will be showing up at the Lands End stage solo on Sunday, he will surely be in possession of his one-of-a-kind entertainment gear and ready to get the crowds’ hands clapping. His voice is soulful, his songs are fun and this show will most definitely be a sight to see. If you need to clear your mood (and headspace) after 2 jam packed days of rocking your socks off then SZA’s brand of chill vibes may just be the thing you need. Her smooth R&B vocals and clever lyrics over a bed of keys and drum patterns is a great start to any day really.